This quaint, yet spacious loft style apartment on the ground level was built in an open style floor plan. The apartment comes with high-end designer kitchen, stainless steel appliances, granite counter-tops with a high top bar. Furthermore the apartment is furnished with a living room that includes a couch, tables and cushioned chairs, along with a queen size bed with linens, towels provided and a computer desk. The kitchen has all the required amenities to make your stay like home. Quality pots, pans, dishes, utensils, coffee maker, toaster and microwave. All you need are your groceries. Outside sits a shaded, private walled-in garden with wrought iron gate, patio garden complete with dinette to enjoy morning coffee or afternoon cocktails.This apartment is provided with all the amenities enjoyed at home, including 32" Samsung Flat screen TV, cable television provided by Comcast. The true gem of this apartment is the neighborhood and city that surrounds it. 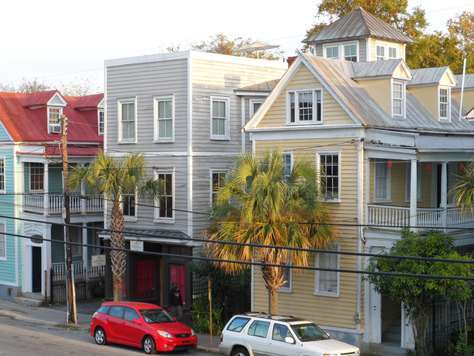 With Charleston being named the Top City in the United States, a block in any direction will take residents to award winning restaurants and shops, including those featured on Food Network and the Travel channel. Come stay in downtown Charleston on a budget, we provide a lot of amenities found in higher end rentals without the price. Our affordable pricing will allow you to stay longer, relax and not feel rushed to leave. Join us on Facebook at Historic Smalls Alley to save on seasonal specials and additional information about what is going on in Charleston the weekend you arrive. All PETS must be approved prior to arrival. I have a pet fee of $100 Non-refundable deposit. We can accommodate all your travel needs a few days a week or a month! 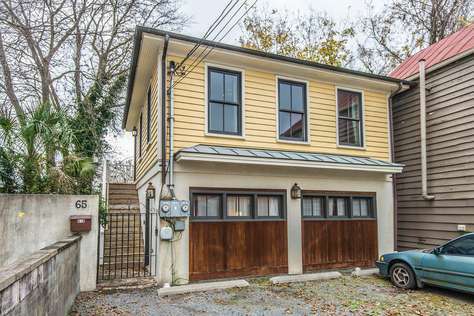 In the heart of the Historic Elliotborough-Cannonborough neighborhood, surrounded by Carolina Palms, lies "Karpeles View" at 65B Spring Street. This quaint, yet spacious loft style apartment is built in an open floor plan. The apartment comes with a high-end designer kitchen, stainless steel appliances, and granite counter-tops with a high top bar. Furthermore the apartment is furnished with a living room that includes a couch, tables and cushioned chairs, along with a queen size bed and a computer desk. Linens and towels are provided. The kitchen has all the required amenities to make your stay like home. Quality pots, pans, dishes, utensils, coffee maker, toaster, microwave and dishwasher. All you need are your groceries! A wall of windows gives a view of the Historic Karpeles Museum of Manuscripts. Not only is the apartment provided with all the amenities enjoyed at home, including 42" Samsung Flat screen TV and cable television provided by Comcast, but the apartment also comes with plenty of closet space to store your luggage. Outside sits a shaded, private walled-in patio garden with wrought iron gate, complete with a dinette. This Unit is Not pet friendly. Please select from one of our other units that allows dogs, if you are considering bringing one along. In the heart of the Historic Elliotborough- Cannonborough, surrounded by Carolina Palms lies 75A Elliotborough "Single Row". This quaint historic apartment was built in 1872. The apartment comes with high-end designer kitchen, granite counter-tops. The apartment is furnished with a living room that includes a couch, tables and cushioned chairs, along with a queen size bed with linens, towels provided and. Kitchen has all the required amenities to make your stay like home quality pots pans dishes, utensils, coffee maker, toaster, microwave and dishwasher all you need are your groceries. The apartment provided with all the amenities enjoyed at home, including 42" Samsung Flat screen TV, cable television provided by Comcast, but the apartment also comes with washer/ dryer and plenty of closet space. This quaint yet small efficiency apartment is on the ground level it's built in an open style floor plan. The apartment comes with basic efficiency kitchenette. 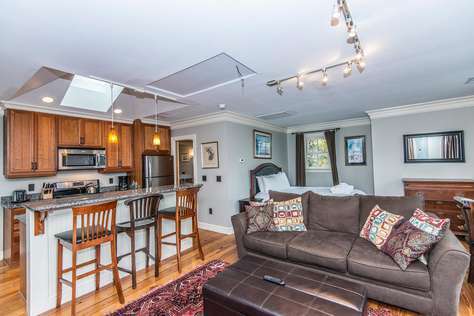 This apartment has a furnished living room that includes a couch, tables, including a 32" Samsung Flat screen TV, cable . There is a separate very small bedroom with a queen size bed, linens and towels provided. Kitchen has all the required amenities to make your stay like home, quality pots pans dishes, utensils, coffee maker, toaster and microwave all you need are your groceries. Outside sits a shaded, private walled-in garden with wrought iron gates, patio garden complete with dinette to enjoy morning coffee or afternoon cocktails. The true gem of this apartment is the neighborhood and city that surrounds it. With Charleston being named the Top City in the United States, a block in any direction will take residents to award winning restaurants and shops, including those featured on Food Network and the Travel channel. 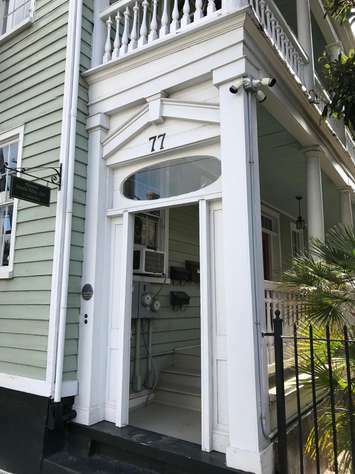 Come stay in downtown Charleston on a budget, we provide a lot of amenities found in higher end rentals without the price. 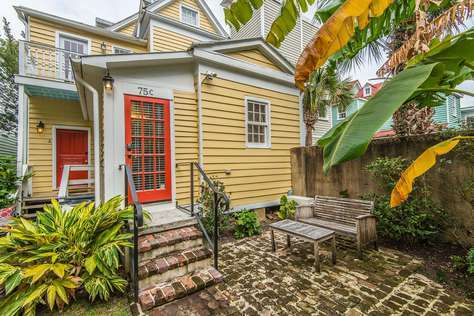 Situated in a quiet courtyard in the Elliotborough-Cannonborough neighborhood sits the “Cannonborough Cottage.” A quaint very small one room studio, this adorable cottage is perfect for short terms stays in historic downtown Charleston at an affordable price. The cottage comes equipped with a stocked bedroom finished with a full size bed and a dresser, Chair and side table.. Also included is a full bathroom with a walk-in shower, complete with tiled flooring and walls. For entertainment, the cottage has a wall-mounted flat screen television outfitted with cable from Comcast. Outside is a fully bricked, private patio with wrought iron settee, chairs and table it sits back from the street to ensure peace and quiet for your stay. WildFlour Bakery is steps away. Furthermore, the cottage is in walking to distance to numerous award-winning restaurants and blocks and blocks of high end retail shops. In the heart of the Historic Elliotborough- Cannonborough, surrounded by great restaurants​ and shopping lies 77A Elliotborough "Single Row". The apartment is furnished with a living room that includes a couch, tables and cushioned chairs, along with a king size bed with linens, towels provided and.